Me and mine spent a lovely weekend in Dublin catching up with my brother and his wife. I owe a lot of my musical knowledge to my brother who always made music a huge part of our lives growing up. For a little while we lived in the middle of nowhere (there were only a few other kids in my year at school), so music became a friend, a link with the outside world, we lived by it and through it. This is one of the reasons I now write a music blog. Now that I live in London I have more access to live music than I know what to do with. The only problem is choosing which concert to go to and finding the time to cram them all in (and of course the money to buy the tickets which is why free instore shows are great!) 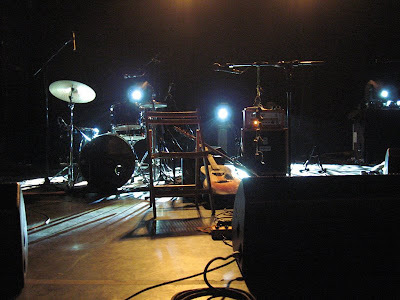 I know I am fortunate to be in this position which is why I like to share my concert experiences and fuzzy photographs with you on this blog in the hope that I can make you feel like you were standing in the front row next to me. There's so much going on on Tuesday! There's also Soy Un Caballo @ the Slaughtered Lamb, Vivian Girls @ Brixton Windmill and Ish Marquez @ the Betsey Trotwood. All of them are really cheap, I wish they were spread out through the week so I coul go to them, but for me Beach House > all. Women are also playing on Wednesday in Brixton. Slow Club and Jay Jay Pistolet are at Union Chapel tonight, I almost would have gone to that. Thanks for pointing those gigs out Anika, Tuesday does seem a bit hyper! :-) I'm off to see Liam Finn @ Scala. Have fun @ Beach House - look forward to reading your review. Glad you had a good time in Dublin! :-) Another good gig on Saturday is The Ruling Class w/ The Outside Royalty at the London Metro Club, the latter band particularly well worth seeing. Thanks for the tip off Citizen Meh!